Below are instructions for the installation of the LH2.4 / EZK wasted spark boards. We're focusing pretty heavily on the installation of the board itself. There are far too many combinations of ignition modules and coils to provide comprehensive instructions on that part of the project. The disclaimer is basically this: Some brain power required, some assembly required, batteries not included. 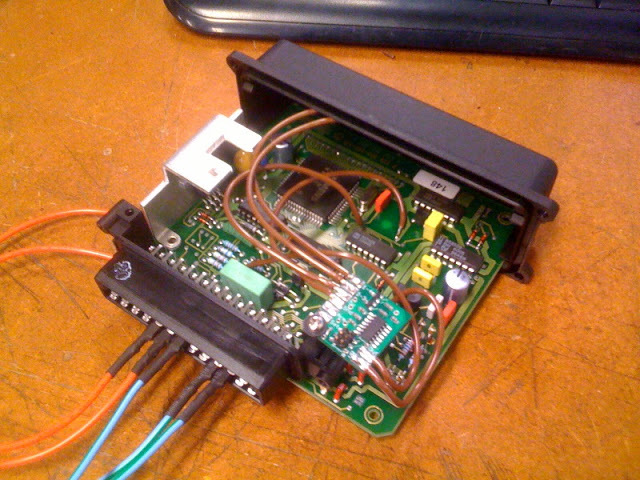 The conversion board has been designed to be mounted inside the stock Bosch EZK box found in later rear-wheel-drive Volvos equipped with LH2.4 engine management and EZK ignition. On 240s the EZK control box is mounted on the front right corner of the firewall, right above the foot well. On 740s and 940s it is mounted under the dash, above the throttle pedal. The conversion board has 8 labeled solder pads. The four pads labeled "5V", "GND", "Spk", and "VR" need to be tied to the four labeled points on the EZK board [fig 1]. "VR" goes to pin 7 of the LM2903 IC. If you tin the leg of the IC you can easily attach a wire to it. 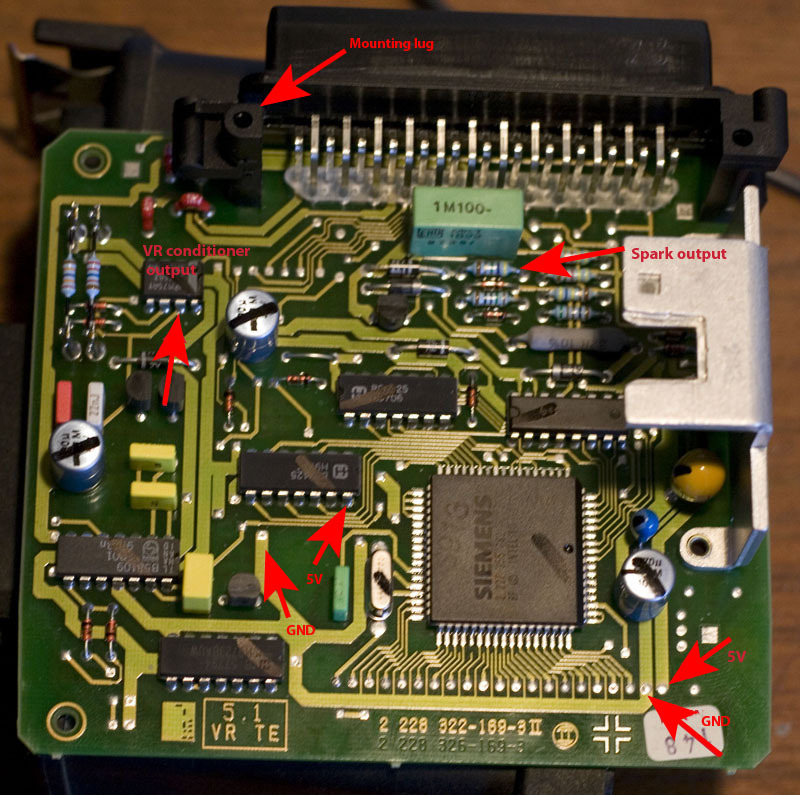 The "Spk" pin is actually intended for pin 16 of the main connector, but we find soldering it to the indicated resistor leg makes for a cleaner installation. If you want to solder your wire directly onto pin 16, feel free to do so. The 5V and GND supply points should be self explanatory. Make sure you don't reverse them. That would be bad. We recommend potting all the wire-to-PCB connections with hot glue to secure the wires from vibration. The two pins labeled 1-4 and 2-3 are the new logic-level spark outputs. They need to come out of the box and go to the proper pins on your power stage/coil. *Important note: on the current batch of boards, the 1-4 and 2-3 pins were reversed in programming. This means you will need to connect "1-4" to cylinders 2 & 3, and "2-3" to cylinders 1 & 4. * If your car is not equipped with EGR you can piggyback on those pins, or you can just drill a hole in the box to pass the wires through, or install a new dedicated connector of your choice. 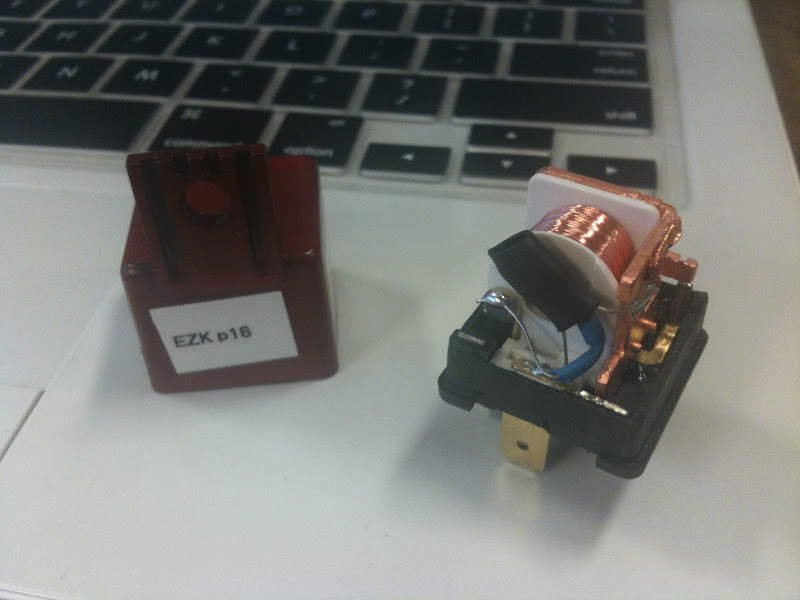 Using the supplied screw and mounting washer, attach the board to the body of the main EZK connector [see Figure 1]. Depending on clearance to the housing, it may be necessary to mount the board in an inverted fashion. We recommend the use Bosch Motorsport 2x2 wasted spark ignition coil (part #: 0 221 503 407, available from CFloMoTo here). This is the only ignition coil we have found with documented dwell characteristics that match the built-in EZK dwell. The stock ignition module has one output stage, but since the wasted spark system requires two outputs you can either install an additional stock ignition module or replace it with a multi-channel equivalent (eg. Bosch 0 227 100 203, Volvo 960, or Hüco equivalent available here). A sample wiring diagram is shown in Figure 2. An example of the wasted spark board installed in the EZK box is shown in Figure 3. Figure 1. Preferred connection points inside the EZK box. Note the multiple 5v and Ground suggestions. Figure 2. Suggested ignition module wiring. Figure 3. Example of wasted spark board installed in EZK box (note small green PCB in bottom right corner, held in place by the supplied screw and plastic mounting washer). Recommended wiring diagrams for the arm and set features are shown in Figure 4. The dash-mounted set switch should ideally be momentary and the clutch switch must close to ground as the clutch is depressed. ﻿Figure 4. Suggested launch control wiring. The first (and arguably easier) method works if you have left the stock ignition power stage and wiring intact. Simply move any wires currently connected to the stock coil's two spade terminals to the "85" and "86" terminals of an automotive relay. To keep the relay from clicking you should open the body of the relay and remove the contactor assembly. An example of this is shown in Figure 5. Alternatively, if you have chosen to remove or modify the stock wiring, then driving the tachometer can most easily be done by building a circuit similar to the one listed in the MS-Extra manual under "Option for High Voltage tacho" (http://msextra.com/doc/ms1extra/MS_E...l.htm#tachoout). The base of the transistor should be connected to the stock EZK spark output pin. Note that this solution uses the same modified automotive relay as mentioned earlier. Figure 5. Example automotive relay modified to act as a tachometer driver.